In a stylish bottle, Belvedere is a single-grain vodka from Poland with subtle sweetness and a smooth, clean finish that has been pot-distilled four times – believed to be the optimum number to enhance character. 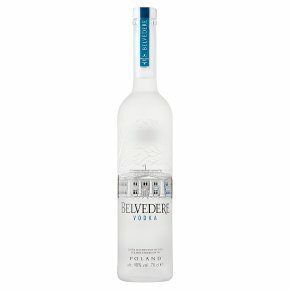 Belvedere takes its name from the palace that was home to Polish royalty and presidents. Only Belvedere tastes like this: unadulterated and naturally smooth. We Keep it Natural. Authentic, the way Polish vodka has been made for over 600 years. Belvedere is unique thanks to our two locally-sourced ingredients: Dankowskie gold rye and pristine artesian water from our own wells. The rye creates character and the water brings smoothness.